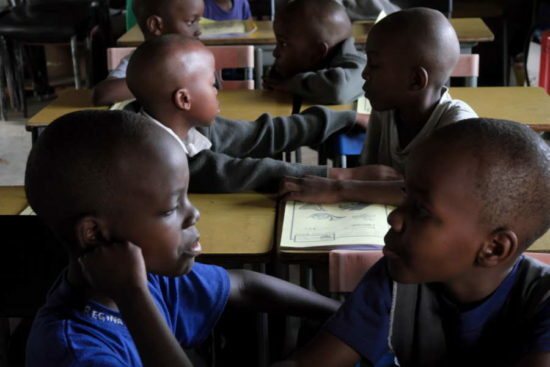 Note: Linda Webster is a UK-based international education consultant that has put in countless volunteer hours with Project Zawadi compiling and creating teacher professional development materials for the Tenda Teachers program. Central to her work has been development of electronic training modules (e-modules) demonstrating active teaching and learning techniques in action in Tanzanian classrooms. The e-modules help teachers learn how to incorporate these techniques into their teaching and will be an accessible resource in areas where professional development opportunities for teachers are very limited. We’ve all had brief encounters on trains, planes, or buses, or maybe sitting next to someone in a theatre or at the cinema. Usually a brief encounter is just that. You chat and you may even enjoy the other person’s company, but once you part, you never see them again. Secondary school teaching using the ‘cold calling’ technique from the e-modules. My brief encounter with Brian was something quite different, however. 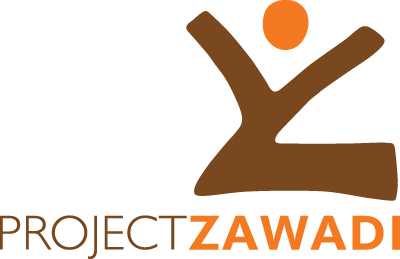 Brian is the Executive Director of Project Zawadi (PZ). We met on a plane in Tanzania and chatted for 20 minutes. Somewhere in that chat, he happened to mention Project Zawadi and the e-modules they were creating. I happened to mention that, as an international Education Consultant and lover of Africa, I’d be very interested in contributing. Little did I realise the impact that encounter would have. Fast forward a few weeks and I was on the team, writing e-modules and accompanying materials. Within a few months of that, I found myself back in Tanzania in the Mara region, armed with some of these materials and ready to try them out. 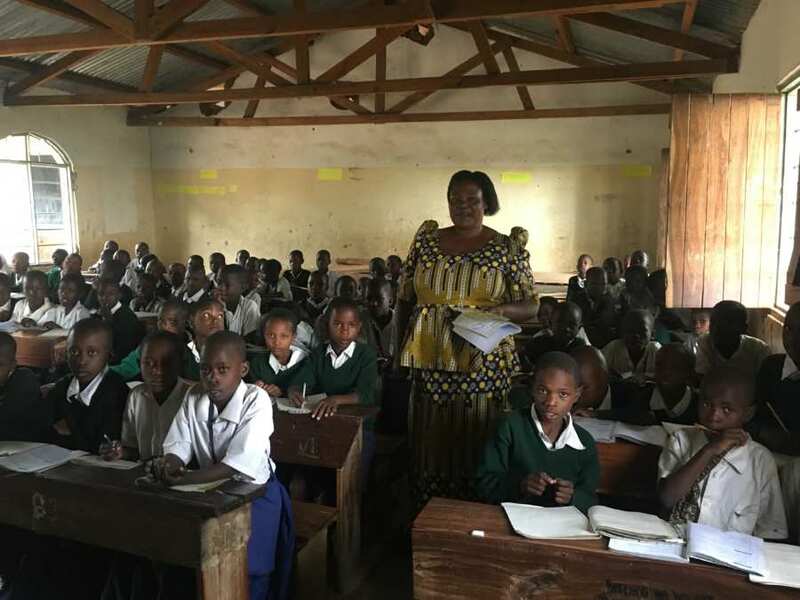 I visited various schools to observe teachers and students and identify which teaching methods would likely have the most impact on learning. 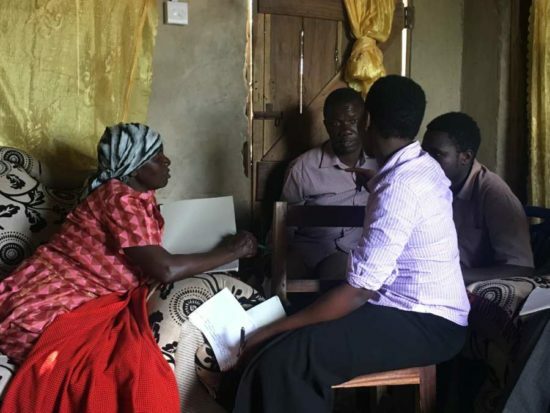 Along with Project Zawadi Directors Adrian and Judith, we met with both teachers and parents and tried out the materials. It was an incredible learning experience for me and I found myself both in awe of the students, who are so obviously keen to learn, and humbled by teachers, who are teaching classes of 100+ students in basic classrooms with minimal resources. We tried out the first e-module at Sarawe Primary School. 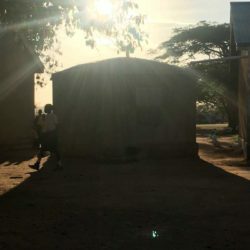 We had to decamp from the school to one of the teachers’ houses because that was the only place large enough for a group of teachers that also had electricity. The teachers seemed to enjoy the e-module – and they certainly took lots of notes! We left feeling optimistic that this approach just might work. And when I returned a few months later, I was able to observe the teachers still using these strategies with their students. Teachers and PZ staff discuss the potential of the e-modules. Teachers discussing the new techniques. Soon all the e-modules had been written, discussed, rewritten, and polished until they shone. All that was needed were videos of teachers in action using them in their classrooms. So capturing that was my task during my third visit to the region. 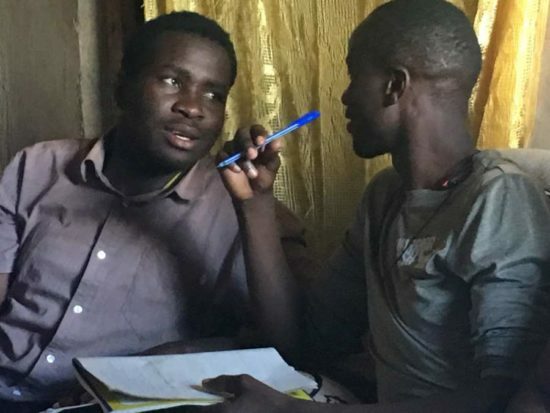 Two local young men, Hashbi and Mickdaddy, filmed and edited the videos and PZ Special Projects Manager, Maneno Wright, was invaluable – in fact, we couldn’t have done it without him. A group of five local teachers had received some additional training from PZ Board Member Ian Keith earlier in the year to prepare them for the videos. It was inspiring to see the changes in their teaching. 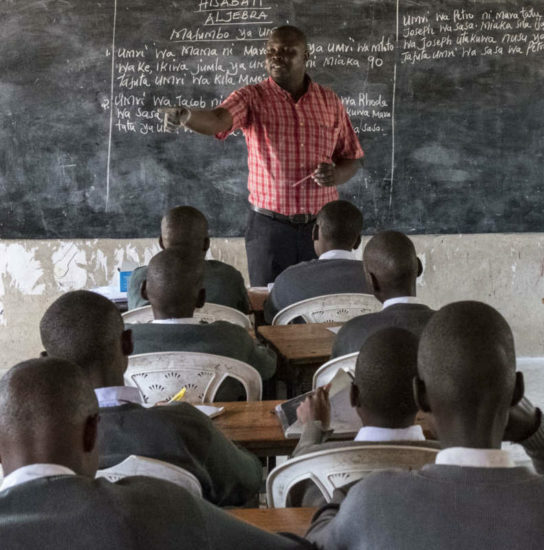 They reported that students were more attentive in class, that attendance had improved, and one teacher even said that exam results had improved. They also told me that they knew their students better and were therefore able to teach them better. I couldn’t have asked for better testimonials if I’d written them myself. 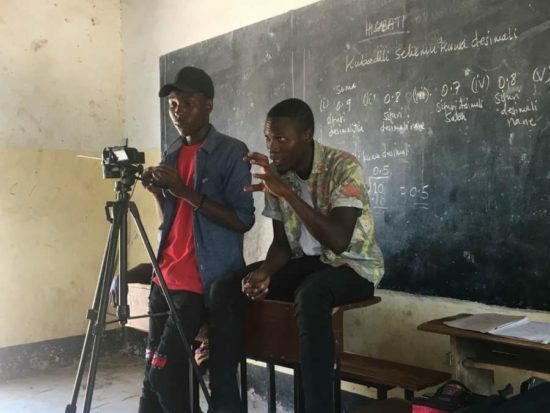 Videotaping of lessons in Tanzanian classrooms was an important part of the e-modules. Students practicing the “turn and talk” technique demonstrated on the e-module. 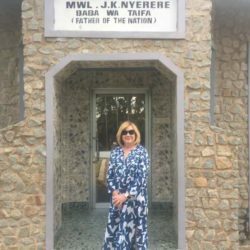 Linda Webster visiting President Julius Nyerere’s birthplace. Sunrise over a traditional home. While most of my time is spent working when I’m there, there are also opportunities to enjoy some of the local culture. For example, the National Flame (the Uhuru Torch which is a national symbol of freedom and travels throughout the country) came to nearby Bunda. I was able to see it along with the carnival atmosphere surrounding it. Adrian has taken me to various restaurants and also opened up his home to me. I was able to go to Butiama and explore the birthplace and museums devoted to Julius Nyerere, the first president of Tanzania. Even simply wandering around Bunda with my camera (I’m a serious photographer) was fascinating. And there is some wonderful scenery between where I stayed in Bunda and the schools where we worked. The best part of this experience, however, has been working with the Project Zawadi staff, volunteers, local teachers, and our video team. I’ve learned so much from each and every one of them and also enjoyed their company. Finally, I’ve loved being among the children, seeing their smiles and hearing their laughter and watching them strain to absorb every bit of knowledge they can. To see how they value their education is truly inspiring. I feel incredibly fortunate to be a part of this.